With the turn of the 20th century, Edmonton was beginning a period of rapid development, initiated mainly by its position as the commercial gateway to northwestern Canada. In 1904, Edmonton became a city, and, in 1905, two other events occurred which would solidify its position as a metropolis. First, the city was named the capital of the new province of Alberta, and, second, just as the first Legislative Assembly was convening in September, the tracks of the Canadian Northern Railway were being laid, giving the city a direct line to Winnipeg and the markets of eastern Canada. Four years later, the Canadian Northern was joined by the Grand Trunk Pacific, with a line through the city’s north end and a spur to the city center. The arrival of these railways brought dramatic change to the city center where, to the west end, a large warehouse district evolved. The north side also saw extensive development as many large industries chose to locate plants and warehouses near the tracks. The railways and the industries they spawned brought masses of working class immigrants to Edmonton, most of who chose to live in neighborhoods near their centers of employment, such as McCauley, Norwood, Riverdale and Bellevue. As a result, small community commercial areas sprang up to provide easy shopping for residents, and facilitate local businesses. Being close to the city center, the McCauley district had little need for a separate shopping district, and yet there remained an inclination for many small businesses to locate as close to the people as possible. As a result, Namayo Avenue (97th Street) was soon developed into a commercial artery, extending from Jasper Avenue all the way to 111th Avenue, with sections of the street also holding small dwellings. North of the tracks, the street soon assumed the appearance of a small community shopping district, with grocery stores, drug stores, hardware stores, restaurants, barber shops, laundries and convenience stores. The shops were mostly modest two story structures, and often the proprietors would live in the same buildings. In June 1914, when the commercial boom in Edmonton had actually just passed its apex, a headline in the Edmonton Bulletin read “New $35,000 Block for Namayo Avenue.” The owner of the property on the corner of Namayo Avenue and Sutherland Street (9664-106th Avenue) was the Calgary business tycoon, William Roper Hull, who apparently saw the need for an office complex in the area. As designed by E.C. Hopkins and opened the following year, the building was no doubt expected to facilitate small retail businesses and apartment dwellers, as well as office space. The concept of the combined facility was not unlike the Beuna Vista Apartments and the Gibbard Block recently erected among small commercial buildings in other areas of the city that were surrounded by extensive urban development. Among the first tenants in what became known as the Hull Block was Herb E. Thomson Drugs, which would occupy the premises until 1940. Countless other tenants also came to occupy the building, which today appears to be serving the same purpose for which it was built 87 years ago. Its historical significance lies in its representation of the tremendous commercial growth of downtown Edmonton during the early part of the 20th century. It is also representative of the kind of commercial structure intended to evoke the ethos of a large office complex, but, due to its location near an urban population, was also made to facilitate small retail businesses and apartment dwellers. It is also a significant landmark in the McCauley district of Edmonton. 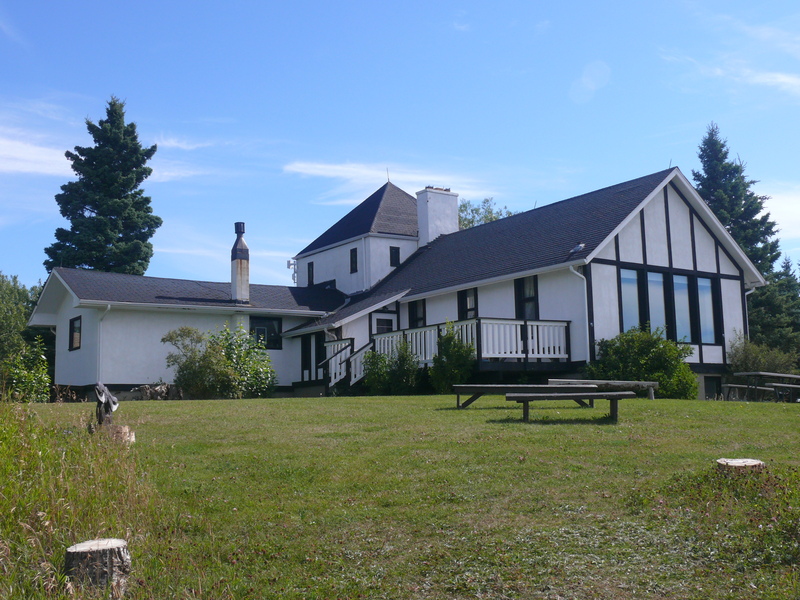 In July 2003, it was designated a Provincial Historic Resource. 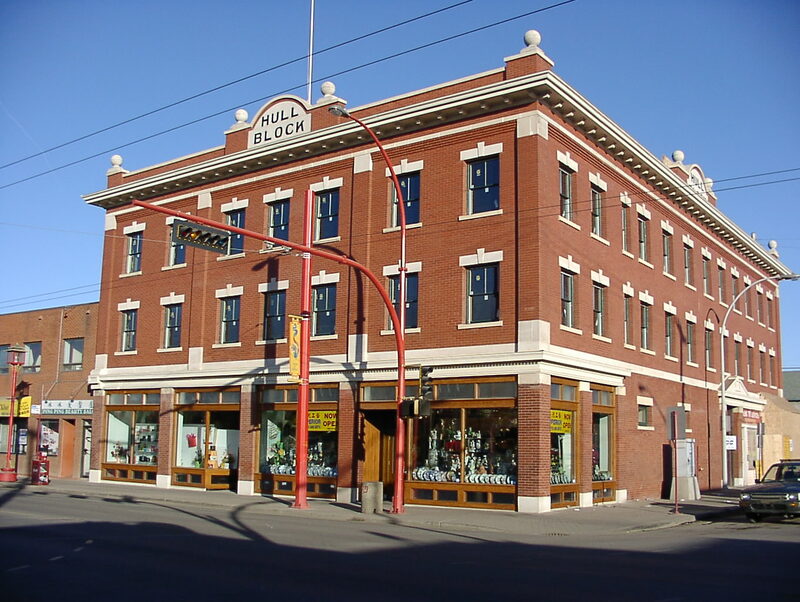 Visit the Alberta Register of Historic Places to learn more about the heritage value of the Hull Block. In order for a site to be designated a Provincial Historic Resource, it must possess province-wide significance. To properly assess the historic importance of a resource, a historian crafts a context document that situates a resource within its time and place and compares it to similar resources in other parts of the province. This allows staff to determine the importance of a resource to a particular theme, time, and place. Above, is some of the historical information used in the evaluation of the Hull Block. On May 10th, I had the pleasure of attending a heritage management planning open house, hosted by the Town of Peace River. The town wanted public feedback on the heritage management policies they have been working on with the Municipal Heritage Partnership Program since September. Posters describing the proposed designation and management policies where hung in various locations around the museum and staff were available to answer public questions. 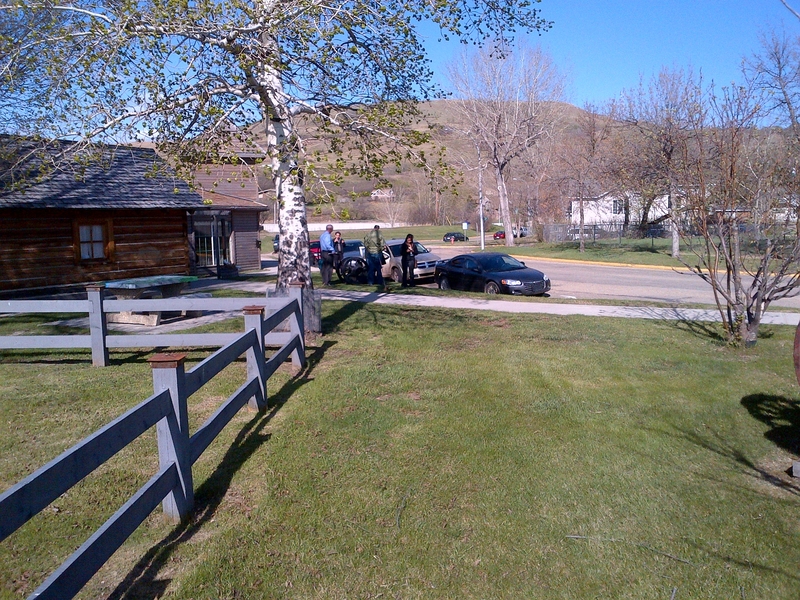 The open house was held near the river at the Peace River Museum and Mackenzie Centre. The plan includes two components: a Municipal Historic Resource designation policy and a plan to manage designated sites. Open house attendees arriving at the Peace River Museum. The Municipal Historic Resource designation policy explains how Peace River will determine if a site is historic and if it should be protected as a Municipal Historic Resource. The policy will specify who can nominate a site for designation and what the town must know about the history and condition of a place to make a recommendation to the town council. These policies will help the town decide if designating a site will protect a place that embodies an important part of Peace River’s heritage. It will help the Town determine if protection is in the public interest. The policy will also help the Town and property owners understand their obligations towards one another should a property be designated. will the changes affect the heritage value of the historic place, allowing the destruction of character-defining elements? will the changes impact the site as little as possible? who within the municipal administration makes these decisions? The management policy ensures that these questions are answered in a consistent and transparent way. Staff at the Town of Peace River are putting the final touches on the management plan and will present it to Town Council in June. We will bring you more details after the plan has been approved by council. If you have question about management planning or any other aspect of heritage conservation, check out the Municipal Heritage Partnership Program website or drop us a line. Upon turning my back on the rainbow to return to my vehicle, I discovered another beautiful site – the Burmis Tree! 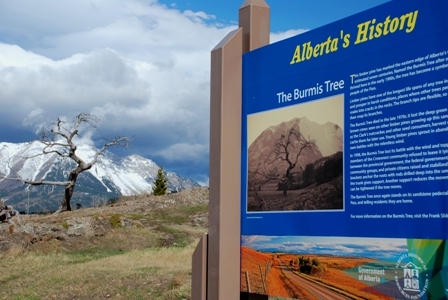 The Burmis Tree is a limber pine that marks the eastern edge of the Crowsnest Pass. Limber trees have one of the longest life spans of any tree in Alberta and are known for their ability to thrive in harsh conditions. As a standing testament to these facts, the Burmis Tree lived for approximately 700 years. It died in the late 1970’s but remained standing until 1998 when high winds toppled it over. The community, which regarded the tree as a significant landmark, refused to simply leave it. Rods and brackets were used to support the tree. To this day it still stands as a landmark, acting as a welcome sign to visitors of the Crowsnest Pass and as a symbol of home for area residents. The leafless, gnarled tree simply needed to be photographed (if you are also a shutter-bug you will understand). As I explored the area photographing the tree from different angles, I next stumbled upon one of the heritage markers erected by the Government of Alberta and the Alberta Historical Resources Foundation. You have all probably seen them – large blue signs located at highway rest areas or points of interest throughout Alberta. These interpretive signs tell of Alberta’s rich heritage. This sign provides context for the Burmis Tree. Assuming that the Burmis Tree is perhaps one of the most photographed trees in all of Alberta, I did a quick search on Flickr. Check out some of the photos. 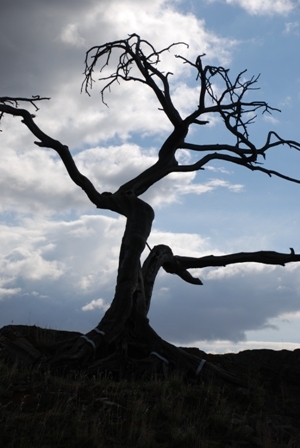 Do you have a photo of the Burmis Tree that you would like to share with readers of RETROactive? If so, email it to me at albertahistoricplaces@gov.ab.ca by June 10, 2012 with a completed copy of the Government of Alberta’s Photograph, Video, Name and Quotation Release Form. A future blog post will feature the submissions. 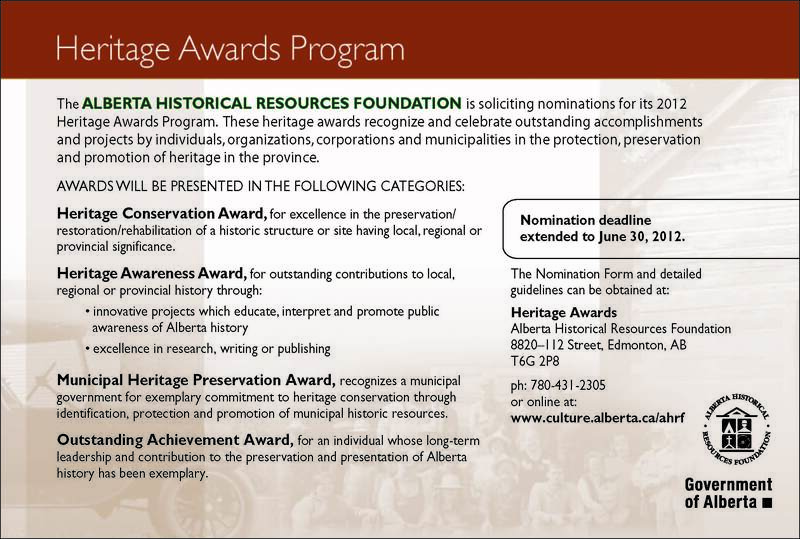 As part of its ongoing efforts to honour local contributions in the protection, preservation and promotion of Alberta’s heritage, the Alberta Historical Resources Foundation is seeking nominations for the Heritage Awards 2012. Deadline for nominations has been extended to June 30. The awards ceremony will take place on November 30th. The Heritage Awards Program provides an excellent opportunity to recognize and celebrate the outstanding accomplishments of individuals, organizations, corporations and municipalities who have demonstrated their commitment in preserving our province’s heritage. Awards are presented as follows: to projects for the Heritage Conservation and Heritage Awareness Awards; to municipalities for the Municipal Heritage Preservation Award; and to individuals for the Outstanding Achievement Award. Conserving Alberta’s heritage benefits all of us, but it is often the actions of individuals and communities that drive these efforts forward. If you know of an exceptional building conservation project, a heritage awareness initiative, a municipality or individual in your community, this is your chance to have them recognized. For a copy of the guidelines and nomination form, click here or contact me at 780-431-2305. Two of the most influential individuals in the history of painting in Alberta were Barbara and Alfred Crocker Leighton. Alfred was born in Hastings, England in October 1901. He attended the Hastings Grammar School, and the Hastings Municipal School of Art, where he studied architecture. He served with the Royal Flying Corps in World War I, and was severely injured after a crash. Following the war, he began to paint landscape scenes and was encouraged to submit his work to the Royal Society of British Artists. He became influenced by the Arts and Crafts movement, established earlier by William Morris, and his paintings in this genre began to draw attention in the early 1920s. In 1924, the Canadian Pacific Railway commissioned Leighton to do paintings about the western Canadian landscape in order to attract potential immigrant farmers. 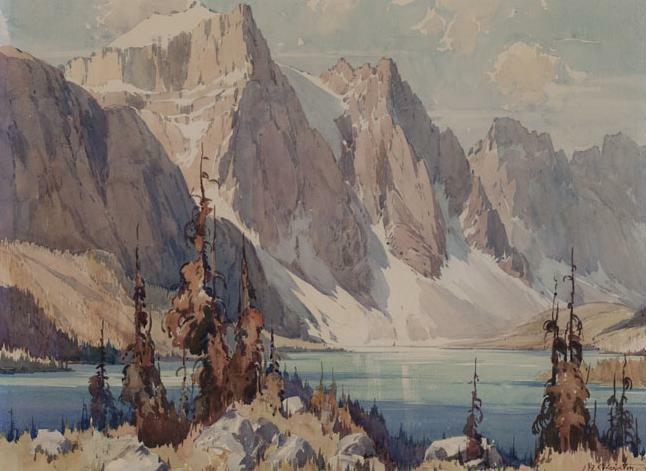 In 1925, he was sent out to paint the scenic Canadian Rockies. 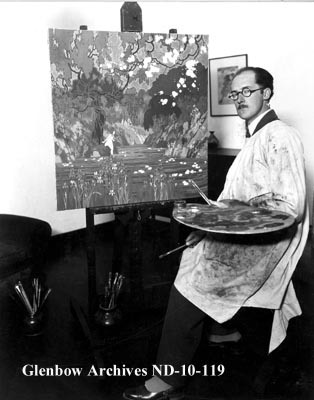 He produced paintings exclusively for the CPR until 1929 when he resigned and accepted the position of Director of Art for the Southern Alberta Institute of Technology and Art, a position he held until 1935 when he was forced to return to Britain due to ill health with his wife, Barbara (Harvey), an art student whom he had married in 1931. Barbara was born in 1909 in Plymouth, and would become a direct associate in all of Alfred’s undertakings. While at the SAIT, Alfred Leighton had been instrumental in founding the Alberta Society of Artists. 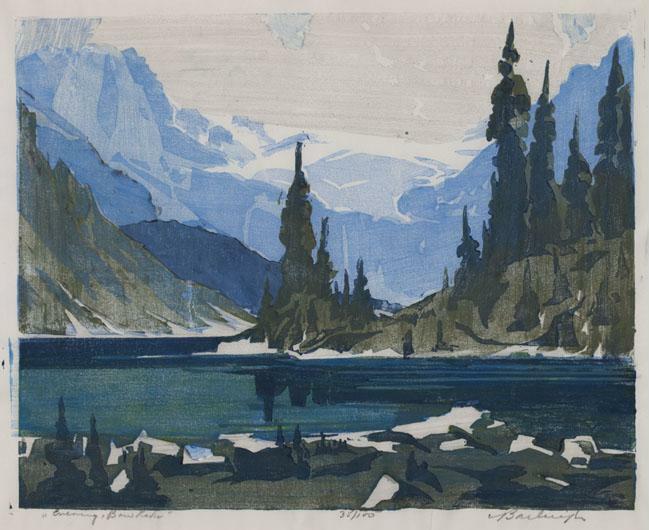 In 1933, he established a summer school in the Kananaskis which was the precursor to the Banff School of Fine Arts. Upon returning to Canada in 1938, he resigned from SAIT and moved with Barbara to southern British Columbia. Here he tried farming in Chilliwack, but soon moved to Crescent Beach, where he and Barbara did commercial art work. Leighton, Barbara. Evening, Bow Lake. Printmaking, woodcut. Alberta Foundation for the Arts. In 1952, the Leightons purchased an acreage near Millarville where they designed and built a one-room dwelling with the idea of having it serve as a art studio, with adjoining rooms to be added later. It was named Ballihamish after the school district of which it was a part. The structure was designed in the form of a cross, which allowed painters to focus on different perspectives of the Millarville Valley and Rocky Mountains at different times of the season. It was completed over the course of many years, with the inheritance from Arthur Leighton’s father in 1960 being a major contributing factor. 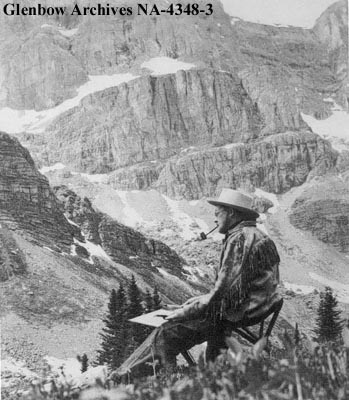 Alfred Leighton painting in mountains. Following Alfred Leighton’s death in 1965, Barbara Leighton established the Leighton Center for Arts and Crafts, which was officially opened in November, 1970. The 1928 Billihamish School was also brought in to become part of the complex. In 1974, she established the Leighton Foundation for the encouragement of art, and an arts and crafts center for all people to engage in landscape painting. The Foundation is currently housed in the Leighton Art Centre, which includes a museum, art gallery, and educational programming. In May 2009, the Leighton House and Art Centre was designated a Provincial Historic Resource. Its historical significance lies primarily in its direct association with Alfred and Barbara Leighton, two of the most influential people in the history of art in Alberta. Leighton, Alfred C. Moraine Lake. Painting, watercolour. Alberta Foundation for the Arts. In the Alberta Foundation for the Arts Collection of over 7500 works there are paintings by Alfred and Barbara Leighton. The collection represents more than 1700 Alberta artists. Like the Leightons, many of these artists have significantly contributed to the development of the visual arts throughout Alberta. You can search the Alberta Foundation for the Arts Collection, and other provincial art collections here. To view works by Barbara Leighton, click here. To view works by Alfred Leighton, click here. Visit the Alberta Register of Historic Places to learn more about the heritage value of the Leighton House and Art Centre. In order for a site to be designated a Provincial Historic Resource, it must possess province-wide significance. To properly assess the historic importance of a resource, a historian crafts a context document that situates a resource within its time and place and compares it to similar resources in other parts of the province. This allows staff to determine the importance of a resource to a particular theme, time, and place. Above, is some of the historical information used in the evaluation of the Leighton House and Art Centre. The New Geographical Names Manual: Bigger, Better, Faster, Stronger! Hot off the virtual presses is the revised and updated Geographical Names Manual. It is now available on the Alberta Geographical Names Program website. What is the Geographical Names Manual? 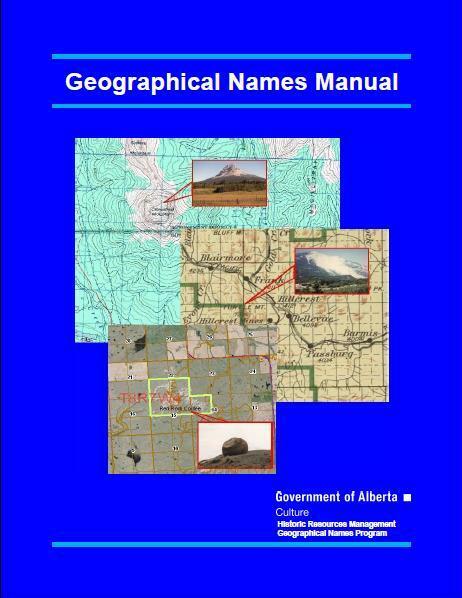 The Geographical Names Manual is the guiding document for naming geographical features in Alberta. It contains a brief history of geographical naming in Canada and Alberta; it identifies and describes the legislation covering geographical naming; and it outlines the roles and responsibilities of the Alberta Historical Resources Foundation and the Alberta Geographical Names Program in geographical naming matters. It also outlines the research done by the Geographical Names Program and attempts to demonstrate the high standards of research and evidence that are required before names are adopted for use on official maps in Alberta. Most importantly, the manual contains the “Principles of Geographical Names.” These principles are used by the Alberta Geographical Names Program to evaluate proposed names for geographical features and proposed changes to existing names before presenting naming proposals to the Foundation for consideration. The Principles are largely based on those used by the Geographical Names Board of Canada, which in turn are based on long-standing, international naming policies and procedures. These international standards have been developed since regulatory bodies were first established to oversee geographical names, more than a century ago. Why do we need the Manual and its Principles and Standards? Standardized principles and procedures for the adoption and revision of official names were developed to ensure a high a level of consistency in land-marking and map-making over time and across jurisdictions and cultures. Maps, whether paper-based or electronic, are an essential navigational tool. For this reason it is essential that the names that appear on these maps are accurate and consistent so that navigation is efficient and free of confusion. However, as human beings, it is also natural for us to want to name our surroundings, thereby affirming our place amongst our geography, identifying features important to us and commemorating our history and our evolving cultural values. The established standards, principles and procedures that have been developed over time are an attempt to balance the need for consistency with our desire to name the landscape. Most people are unaware that there are naming standards and a process for the adoption of official names. The intention of the manual is to make the standards, principles and procedures available to the general public in a format that is accessible and understandable. People considering making an application to have a new name adopted for a geographical feature or proposing a change to an existing name are encouraged to read the Manual, particularly the “Principles of Geographical Names” section. An understanding of the Principles can save substantial effort and make the process much clearer and easier to understand. Why was the Manual updated? Revising the Procedures section to better reflect the path taken by naming proposals from receipt of application to official rejection or adoption of the proposed name. The most significant change was the addition of sections explaining naming procedures in areas where the Government of Alberta shares jurisdiction over naming matters – National Parks (with Parks Canada), Canadian Forces Bases (with the Department of National Defence), and Indian Reserves (with the Aboriginal and Northern Affairs Canada and the affected First Nations tribe, band or community). Also added were sections explaining the naming procedures for features that lie on or cross an inter-provincial boundary into Saskatchewan, British Columbia or the Northwest Territories or for features that cross the international border into the state of Montana. So, there it is. The new and improved Geographical Names Manual is available as a PDF on the Geographical Names Program website. We hope that all Albertans interested in our province’s naming heritage will find this revised edition of the manual useful, interesting and educational. In the near future the Geographical Naming Application form and the webpage itself will also be updated. 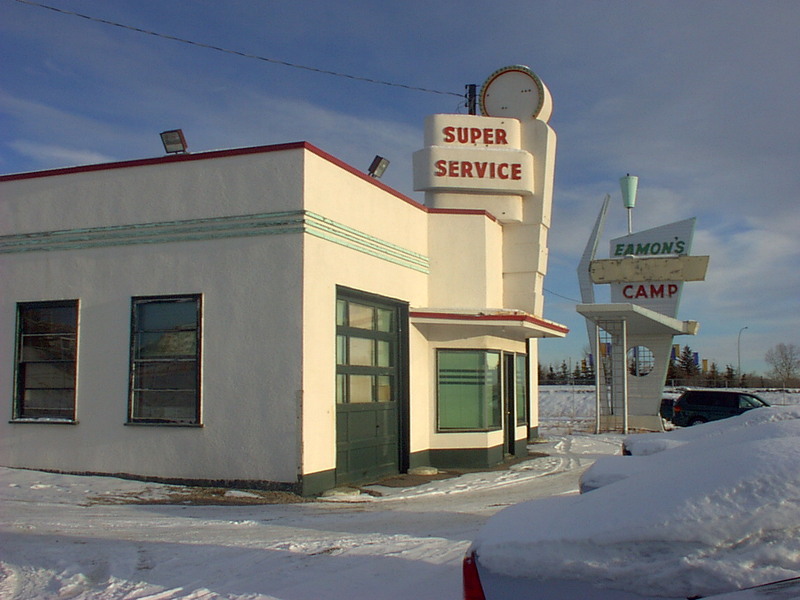 You may have read that Calgary’s city council has decided to incorporate the Eamon’s Gas Station (also known as the Eamon’s Bungalow Camp) into the planned Tuscany LRT Station. Calgary will conserve a historic resource rather than demolishing it to make room for parking. This is exciting news! We recently talked with Christy Caswell, one of the City’s Heritage Planners, and she said that Calgarians today are enthusiastic in supporting their city’s historic places. The interest garnered by the Eamon’s project has been one of many catalysts for people to think about historic places in a new way, and how they can be creatively integrated with new development. Alberta’s municipalities can identify and conserve historic resources without the provincial government’s permission or involvement by legally protecting these places as Municipal Historic Resources. If interested, municipalities can also offer conservation incentives. By extension, each municipality is free to determine its own criteria for deciding what to designate. Calgary is a fine example of this. Calgary has identified a range of heritage values that a place must reflect to be considered for conservation. For example, the Calgary Heritage Authority has overseen the development of context papers for many of Calgary’s historic communities. The city’s heritage planning program regularly evaluates potential historic place for significance. The result is Calgary’s Inventory of Evaluated Historic Resources. Each place on the city’s inventory reflects a local heritage value. Indeed, the Eamon’s Bungalow Camp is one of over 600 places included on Calgary’s Inventory. Be sure to read the listing to learn about the site’s history. The Municipal Heritage Partnership Program (MHPP) helps municipalities develop programs that will identify, evaluate and conserve locally significant historic places. For more information, visit the MHPP website.